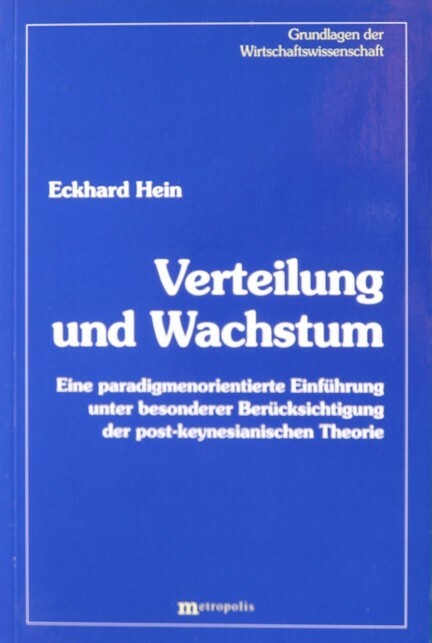 Eckhard Hein has written the book Verteilung und Wachstum, because he wants to give a more prominent place to the problem of distributions of income. And it must be said: he does a thorough job. Each chapter is dedicated to a certain economic paradigm, and investigates the role of the distribution in it. Those roles differ clearly among the various paradigms. It is the merit of Hein to explain in a easily accessible way, also for the average reader, what the foundation is for the concerning paradigm. A critical evaluation at the end is part of each description. There Hein identifies the characteristic and weak points of the paradigm, so that the reader gets a feeling for its practical usefulness. The reader may ponder over this. Only the first chapter discusses the empirical data, that have been gathered in statistical research and studies. It turns out that in the modern western industry states since the seventies of the last century a decreasing part of the national income is allocated to the factor labour. That is to say, the share of the income from labour diminishes. Hein also studies the economic growth and concludes, that it decreases in those states. But at the same time since the eighties the interest rate has risen above the rate of growth. Apparently the functional income distribution (for labour and capital) is not really constant in time, such as has been supposed in the past1. First of all Hein takes in hand the classical paradigm, that also came up first in history. The classical analysis of mainly Adam Smith and David Ricardo leans heavily on the hypothesis of the class society. The wage level and with it the distribution are determined by the natural or historic habits. The paradigm has the shortcoming, that the technological progress and the credit are ignored. The next chapter is attributed to the classical economist Karl Marx. His distribution theory is founded on the social conflict between the classes. The capitalists compete with each other by persistently raising the labour productivity. The progress is labour-saving. In the end a situation of over-accumulation is reached, which results in the crisis. Hein criticizes the price transformation of Marx. Also the paradigm does not consider the influence, that is exerted by the expectations of the capitalists. In the neoclassical paradigm the distribution theory and the price theory coincide. The prices are the indicators of scarcity. Also in this chapter Hein illustrates the theory by means of simple formulas, based on the Cobb-Douglas production function and the growth model of Solow. The propensity to save and the capital coefficient determine the steady path of growth. Despite the popularity of the neoclassical paradigm Hein rejects its application for the macro-economy. Namely, the whole idea of equilibrium and factor substitution is theoretically unsound. Moreover she makes unrealistic assumptions, such as the complete use of the production capacity, and the absence of money effects. Hein makes an interesting side-leap to recent efforts to enrich and extend the neoclassical paradigm with models of human capital (say education), and of research and development2. Thus human capital is a scarce commodity. That could explain why the developped western states can maintain their leading global position. After Hein has thus discussed the older paradigms, he devotes the remainder of the book to the Keynesian paradigm. Keynes himself has done little research with regard to the income distribution, and therefore Hein refers in these chapters to these theories and models as post-Keynesian. First of all he studies the Harrod-Domar model, which analyses among others the use of the production capacity. Especially Harrod also studied the instabilities of the system (the so-called knife-edge). Hein points to several weaknesses in the model, such as the assumption of a constant propensity to save and of a constant degree of usage of the capital goods. Kaldor has developed a real distribution theory for a growth path with full employment. In his version of the post-Keynesian paradigm the investments can run up the profit rate. In other words, according to Kaldor the accumulation determines the income distribution. According to Marx the cause and the result are exactly reversed. Clearly science is a paradox. Evidently also the model of Kaldor makes a number of assumptions, that are controversial. For instance Kaldor believes that in a situation of full employment the workers will accept a fall of their wages. This idea gives an incommodious feeling. Hein compares the model of Kaldor with the theory of Robinson. Robinson (a woman, at last!) denies the existence of a steady growth path3. Such a growth path would make true the expectations of the producers. However, in reality the growth keeps changing due to all kinds of disturbances. The so-called post-Keynesian fundamental model is derived by combining the ideas of Kalder and Robinson. Hein criticizes this model, among others because of its assumption, that the product prices are extremely flexible. The idea is that this guarantees the full usage of the production capacity. The chapter about the models of Michal Kalecki is particularly nice. Kalecki discovered some years before Keynes the importance of the investments for the seize of the national product. In an ideal world Keynes would have shared the fame, that fell to his work, with Kalecki. Unfortunately, many first ones will be last (Marcus 9:35). The distribution model of Kalecki assumes partly that prices are rigid. In particular in the case of oligopolies the prices are set in a purposive manner. And contrary to Keynes Kalecki did develop ideas about the income distribution. An essential part of the theory of Kalecki is the shape of the investment function I. Hein discusses various proposals for the shape of the function I, such as the one of Rowthorne and Dutt, and the one of Bhaduri and Marglin. According to Rowthorne and Dutt the investments depend on the profit rate and the usage of capacity. There is always the danger that the productive capital is too large in relation to the demand for goods. Then a part of the machinery is idle, and that affects the profit rate. Bhaduri and Marglin also take into account the costs and the market demand. Hein is fairly positive with regard to this approach, especially the one of Bhaduri and Marglin. Until now the models still lack the monetary factor, especially the influence of the interest rate i. Hein discusses a proposal by Lavoie to include also i in the investment function I. Of course credits are beneficial for the investments. However, Hein concludes that in the end the interest rate influences the other economic quantities in a rather complicated way. Finally Hein presents the model of Bhaduri and Marglin for an open economy. That is to say, the foreign trade is added to the model. Here especially the imported raw materials for production are relevant. Your columnist prefers to stick with just the national economy. But this chapter will certainly please those, who study international trade. It opens a new world. Hein concludes that the post-Keynesian paradigm is preferable, notably the version that is founded on the Kaleckian distribution- and growth-theory. This group of models takes explicitely into account the really occurring phenomena, such as unemployment, idle production capacity, and oligopolies. Thus the effective demand is described in a credible manner. Your reviewer can recommend Verteilung und Wachstum. In the first place the book gives a clear, topical and fairly complete survey of the now known paradigms in the macro-economy. The use of mathematics and of simple drawings makes the matter easily accessible, at least for your reviewer. Thus a solid foundation is presented for further studies. But despite its qualities 288 pages are naturally insufficient for the elaboration on the spiritual richness of the paradigms. The reader just has a taste, awakens his curiosity, and is stimulated to consult more advanced books. At the same time it must be stressed, that the contents is not easily digestible. Therefore this review is indeed a bit long. The style of Hein is partly to blame. It is clear but dry and very detailed. Humour and suspense are hard to find. The text requires a careful study, preferably again and again (which your reviewer has not done). So it is logical, that Hein wants to know more. For the height of the income determines the chances for participation in the society. Fortunately H.G. de Wolff is still free! It is not surprising that the income is a continuous source of back-breaking worry for people, which is expressed in bitter humour. A mother gives her son two peaches to share with his sister. When later the mother sees how he eats them himself, she asks: "Were you not supposed to share them with your sister?" The son replies: "Yes, and I will. I have asked her what she prefers: now a peach, or later lots of peaches. She chooses for later a lot. So in a minute I will give her the two stones". The following joke illustrates that also adults worry. The will says that the son must give as much money to his sister as he himself wants. He pays her €1000 and keeps the other €9000 for himself. His sister is not satisfied, and starts a lawsuit.The judge sentences: "The son wants €9000 from the heritage. According to the will that part must be given to the sister. The remaining €1000 are for the son".